Jacopo Carucci Pontormo (Attributed), Portrait of a Youth, 1494–1557. Oil on wood, 24 ½ x 19 ½ inches. Collection of Cranbrook Art Museum. Gift of George Gough Booth. Carol Wald, The Necklace, 1978. Collage, 12 x 8 7/8 inches. Collection of Cranbrook Art Museum. Gift of the Artist. Daniel Libeskind, Four Ages of Space, 1982. Lithograph printed on Arches cover white, 28 x 22 ½ inches. Collection of Cranbrook Art Museum. Gift of the Artist. Ralph Rapson, Sketch for Children’s Furniture (Rapson #21), 1941. Graphite on yellow tracing paper, 9 ¾ x 16 13/16 inches. Collection of Cranbrook Art Museum. Gift of Ralph Rapson. Joan Mitchell, Preface for Chris, 1973. Oil on canvas, 103 ½ x 145 inches. Collection of Cranbrook Art Museum. Gift of Rose M. Shuey, from the Collection of Dr. John and Rose M. Shuey. Dorothea Rockburne, White Angel #1, 1981. Folded paper and blue pencil, 70 x 46 inches. Collection of Cranbrook Art Museum. Gift of Rose M. Shuey, from the Collection of Dr. John and Rose M. Shuey. Brittany Nelson, Mordançage, 2011. C-print (Edition 1/5), 73 x 73 inches. Collection of Cranbrook Art Museum. Museum Purchase with directed gifts from Adele and Michael Acheson; Maggie and Bob Allesee; the Maxine and Stuart Frankel Foundation; Jeanne and Ralph Graham; Mariam C. Noland and James A. Kelly; Kathryn Ostrove and David Klein; Corrine Lemberg; Ruth Rattner; Catherine and James Rosenthal; and Kimberly Warden and Jeffrey Schuman. Anthony Burrill, I Like It. What is It?, 2004–2011. Woodblock printed on 100% recycled paper, 35 ½ x 25 ½ inches. Collection of Cranbrook Art Museum. Gift of the Artist. Corine Vermeulen, Sylvia, 2009. Pigment print, 26 5/8 x 32 5/8 inches. Collection of Cranbrook Art Museum. Gift of the Artist. Andrew Moore, Bob-Lo Steamboat, 2009. C-print (Detroit Edition 2/5), 37 x 47 inches. Collection of Cranbrook Art Museum. Gift of Kathryn Ostrove and David Klein. Romare Bearden, Tidings, 1973. Silkscreen and offset lithograph, 15 7/8 x 23 3/4 inches. Collection of Cranbrook Art Museum. Gift of Forstmann-Leff Associates, New York, through Frontline. Mel Ramos, Touche Boucher, 1974. Collotype print, 20 1/8 x 26 ½ inches. Collection of Cranbrook Art Museum. Gift of Jack A. and Ethel M. Zaratzian. The Cranbrook Salon is the second installment of an ongoing series that explores Cranbrook’s collections through the history of exhibition design. This display draws its inspiration from the salon-style hanging technique, which originated in late seventeenth-century Paris at the French Royal Academy of Painting and Sculpture. 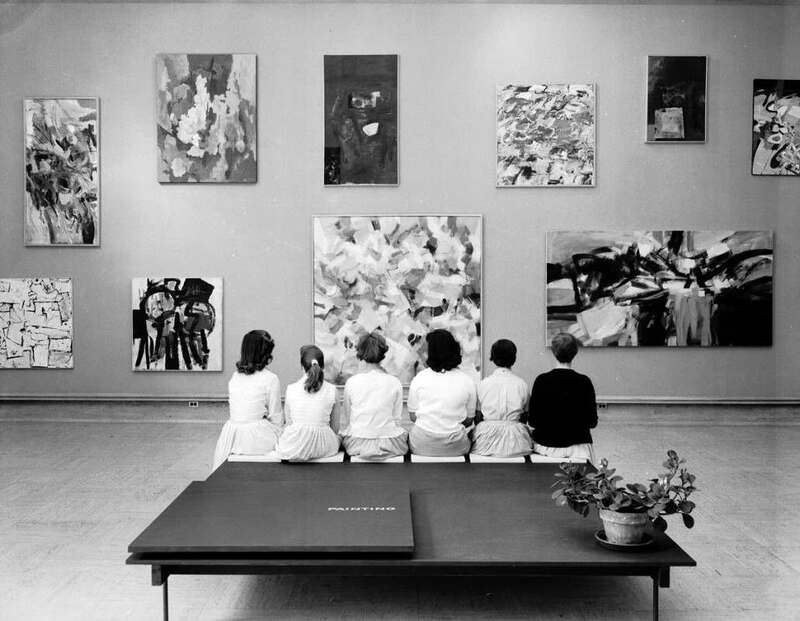 In order to accommodate the great quantity of works submitted to the annual student exhibition, the paintings were hung floor-to-ceiling. The exhibition later relocated to the Salon Carré (Square Salon) at the Louvre, and the event—and its mode of display—eventually adapted its name from the venue. This contemporary installation explores the salon as a mind map, constructing thematic connections and groupings from artworks that span wide-ranging stylistic movements and time periods. While the handheld gallery guide provides insight into these groupings, viewers are also invited to explore the exhibition with minds open to discovery, forging their own associations between these works of art. The Cranbrook Salon is accompanied by a series of events orchestrated by The Detroit Bluestocking Crew, a collective of female creatives organized for this exhibition. These programs activate another historic model of the term salon—a gathering for socialization and the exchange of ideas. Both within this gallery and in locations throughout the city of Detroit, Cranbrook Art Museum will present lively programs co-hosted by performers, writers, and scholars from the region.